In the two centuries that the U.S. Mint has been producing coins, dozens of different kinds of gold and silver coins have been put into circulation. There are myriad different varieties of coins, including official series of collectibles, historical territorial and state coins, official foreign coins and more. All these different coins, from the most worn to the shiniest proof, exhibit slight differences in coin grade that can dramatically impact the coin’s value. It’s useful to know a bit about the technical aspects of how to grade gold and silver coins when looking to purchase gold or silver coins, either for collectible or investment purposes. According to PCGS, a professional coin grading service, objective grading standards remove subjective determinations and assure collectors that they are paying a fair price for a rare coin. It is the coin’s condition, or grade, and rarity that most impact the coin’s numismatic value. As an aside, when buying rare coins, the value of the precious metal contained in the coin also impacts its value. The problem with this simple grading scale was that some “good” coins were much better than others. Eventually, more grades were introduced, like very good, very fine, and about (almost) uncirculated. Proof coins were added as another category of uncirculated. It was not until 1948 that a numismatist named Dr. Sheldon developed the Sheldon Scale, the 70-point scale we have today. His original theory was that a coin with a grade of 70 would be worth 70 times as much as a coin with a grade of 1. This rule is not really in use today. For example, the jump from about uncirculated to uncirculated may add hundreds or thousands of dollars to the value of some coins. Still, rare coin values are correlated to different grades, with higher grades indicating greater worth. But how can two uncirculated coins have different grades? For example, coins that were struck earlier in a production run may be more defined than later production runs. To add even more clarification, proof coins will have the designation of PF as a prefix before any of the other grades. Typically, proof coins are uncirculated and in mint state, but they could be found in lower grades if they were accidentally circulated or damaged in some other way. Sadly, one of the most common examples of damage to proof coins was caused by misguided attempts to clean them. The two main organizations that grade coins today are PCGS, the Professional Coin Grading Service, and NGC, Numismatic Guarantee Corporation. PCGS began operations in 1986; NGC began in 1987. Professional coin graders that work for credible services have years of experience and training, therefore, submitting valuable coins for professional grading is always advised, and every collector and investor will benefit from understanding the grading scale. For those who might wonder if their coin is worthy to be graded, PCGS, for example, has a handy tool that they call Photo Grade, and you can use it to compare your own ungraded gold coins to photos of coins in different grades. For example, you can visit the Liberty Head $2.50 gold coin page to see that the difference between the highest AU and lowest MS coin is mostly apparent as a bit of wear on the raised details, like the eagle’s feathers on the reverse and the LIBERTY motto on Lady Liberty’s cap on the obverse. Yet the difference in value between AU and MS, according to USACoinBook, can be over $100, and with some gold coins, the difference in value may be much more. NCG also suggests getting a copy of The Official American Numismatic Association Grading Standards for United States Coins, and following along with the text and photographs. Scottsdale Bullion and Coin is a fantastic place to start, as well. Their highly trained staff is always happy to take a look at your coins and help you determine if you might benefit by having them sent in for professional grading. The most obvious reason to have professionally graded coins is to have an objective way to measure the value of purchases and sales when buying gold and silver coins. It is also useful when it comes time to sell gold coins. Differences between coin grades can be subtle, and some can only be detected with the aid of a jeweler’s loupe and years of experience comparing coins of different grades. 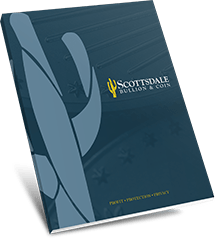 Both buyers and sellers can submit their coins to a grading service or take them to a certified coin dealer, like Scottsdale Bullion and Coin, for help with professional coin grading.